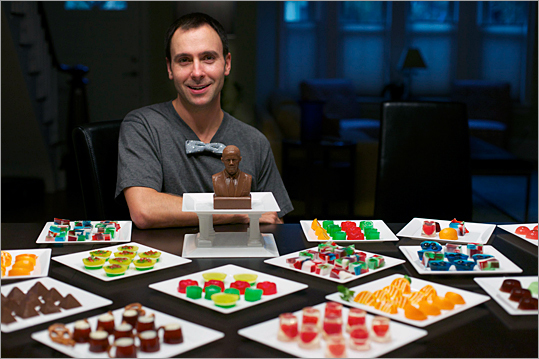 (BRIAN FEULNER FOR THE BOSTON GLOBE) Matt Micari with his batches of alcoholic and non-alcoholic Jello-O shot creations. “Barack Obama is in the fridge,’’ Matt Micari assures me, as he puts the finishing touches on the gourmet Jell-O shots he has made for a house party in Jamaica Plain. The leader of the free world is not in Micari’s refrigerator, but what is there is a detailed mini-bust of the president Micari has fashioned out of gelatin. It’s what I’ve come here to see - and maybe slurp. It’s a Saturday night, and as the doorbell rings at increasingly frequent intervals, Micari plops nine varieties of bite-size treats out of their molds, like little wobbly pieces of stained glass. Lined up like petit fours on dessert plates, they almost look too precious to eat. But once I have tasted a sample - fresh blueberries burst in my mouth after I bite into a neon-blue buttercup - I can’t wait to pop in another. A mini root beer flavored mug with vanilla foam comes with a handle made from a pretzel. It’s a perfect, salty crunch to complement the spicy soda. One rose-shaped morsel tastes surprisingly similar to the flower itself, thanks to the rose water Micari has mixed in with the gelatin. And a four-layered sriracha shot, which features a squirt of the mouth-burning sauce and fresh cilantro atop strata of pineapple, lime, and coconut milk gelatin, deserves a place on the menu of any Vietnamese restaurant. I sneak two. Around that time, Micari started Gelology (www.gelology.blogspot.com), a blog where he could write about his creations. That led to party requests from friends and even a few catering gigs. Today, Micari has compiled more than 80 recipes and is thinking about ways to go into the business full time. There may not be a better time to do it, because a gourmet gelatin trend seems to be building around the country. According to Lynne Galia, a company spokeswoman, Kraft Foods has seen an uptick in consumer interest in Jell-O molds and recipes. The company is in the midst of creating “bigger and better’’ molds that will hit the market next year. Micari was inspired to make his own molds after seeing the work of artist Liz Hickok, who began photographing her jiggly re-creations of San Francisco - block by block - in 2006. Other bloggers, at sites such as www.myjelloamericans.blogspot.com and www.jelly-shot-test-kitchen.blogspot.com, have refined the science - and the art - of gelatin shots. Even Martha Stewart Weddings recently endorsed the idea for high-class soirees. And last year the Gowanus Studio Space in Brooklyn, N.Y., hosted its first Jell-O Mold Competition. Back at the house party in Jamaica Plain, Micari brings his Obama out after everything else has been plated and served. When he sets the bust down, the jellified president seems to shake his head disapprovingly. Suddenly I feel guilty about wanting a bite of the ear. I don’t cut into the president, but I do taste a pyramid-shaped sample of the salted-caramel gelatin. It’s smooth and pudding like. The contrast of salty and sweet plays well. Rob Anderson can be reached at randerson@globe.com. CORRECTION: The name of biologist Matt Micari was spelled wrong in a Food story about JELLO-O shots that ran in The Boston Globe on Oct. 12, 2011.